I’ve made pizzas when my kids were at home, when we’ve invited guests, to celebrate special occasions. Years back we didn’t get frozen pizzas, or ready made pizza base. 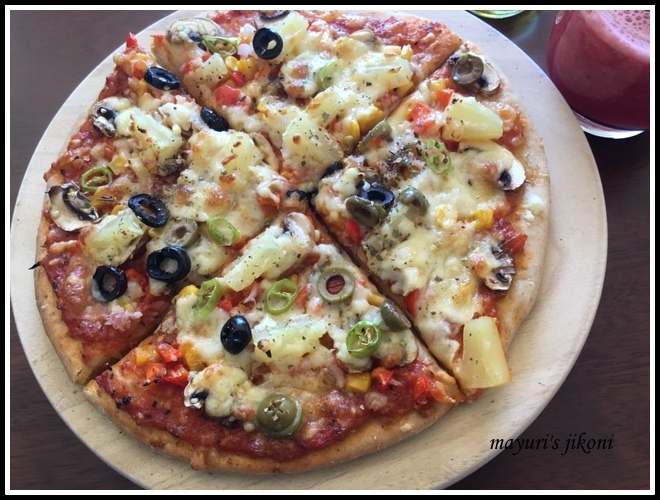 There were not many places making pizzas back then, so the only option was to make them at home.Made them quite often but never ever thought of posting my pizza recipe. Actually don’t know why I haven’t done so till now. Well, as they say its never too late. I must thank my #FoodieMonday #Bloghop friends for choosing the 41st theme as #Pizzamania. Normally on a Sunday hubby and I go to our favourite restaurant IL Covo to have either a pizza or lasagna. We usually land up with a pizza as they are baked in a brick oven using wood. The pizzas are simply amazing. Homemade ones don’t give the same result. However, pizzas whether home made or ready made are mostly everyone’s favourite. I still have to come across someone who hates pizzas. When the group decided that we make pizzas, I was excited. Whenever I make pizzas at home besides having a measurement for the dough, I don’t measure any of the other ingredients. So this time round, I actually had to measure everything to write this recipe and my kitchen was like a war zone. Paper, pen, ingredients, measuring cups, bowls, all over the place. We prefer thin based pizza.I prefer making the base from wholewheat flour and add some all purpose flour to it. I usually keep all the toppings ready and guests can ‘order’ whatever topping they prefer. Some love mushrooms, some don’t. Hubby doesn’t like sweet pepper, some like it without garlic and onion, some don’t want pineapple, some want extra olives. So without any more delay here’s my home made pizza recipe. Add salt,yeast and sugar. Mix well. Add 1 cup warm water and form a dough. Dust the worktop with little flour and knead the dough for 7-10 minutes till its soft, elastic and smooth. Form the dough into a ball shape. Apply oil over it. Put in the greased bowl. Cover the bowl with a tea towel or cling film and let the dough rise till its double the size.This may take about 1½ hours. Add onion and stir fry till it becomes soft. Add garlic paste and stir fry for a few seconds. Add the tomato puree, salt and sugar. Cover the pan and let the sauce simmer till it becomes thick. Remember to stir occasionally so that the sauce does not stick to the bottom of the pan. Take the pan off the heat and remove the cover when the sauce becomes thick. Add pepper and mixed herbs.Mix well. Chop and prepare the required toppings. Gently knead the risen dough. Using some flour, roll each part into a pizza base about 7″- 8″ in diameter. Place the rolled base on the baking tray. Spread some sauce over the base. Add chillis, red chilli flakes and herbs. Bake the pizzas for 10-15 minutes or till the edges become light golden brown. * To prepare a thick tomato puree, I wash and cut the tomatoes into 4 pieces.Then I put in a pan, cover it let the tomatoes cook over low heat till they becomes soft. I let it cool for a while and then liquidize the tomatoes. If you prepare thick base pizzas, then divide the dough into 3. The amount and types of topping is just a rough guideline. Use toppings of your choice. The amount you add to your pizza is also your choice. The amount of water required to form the dough depends on the type of flour. I used only 1 cup water. If I am preparing more than 2 pizzas, I change the positions of the trays halfway.This will ensure that the base becomes a bit crispy. If you have a pizza stone, use it as it will give you better results. Loved the look Mayuri. Pizza looks super yummy. That pizza looks so perfect…and a healthy wheat flour base too..lovely share. Homemade pizza looks delicious love this one. Lovely looking Pizza!! Very well explained. Hats off.